Nutritional yeast comes in flakes or in a ground powder similar to fine cornmeal, and it is a deactivated yeast product. With its high nutritional value owing to complex B vitamins and minerals, it is a favored complete protein ingredient for both vegetarians and vegans. You can find nutritional yeast in health and natural-food stores in the bulk bins as flakes or in canisters on store shelves in powdered and flake forms. Both can be used interchangeably in recipes. 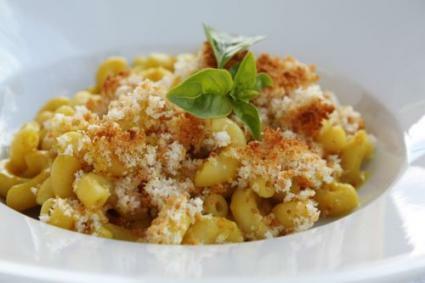 With its savory and slightly salty flavor profile, nutritional yeast is a good substitute for cheddar or Parmesan cheese in pasta dishes, popcorn, and other recipes. The color of a typical macaroni and cheese dish is yellow-orange from the cheddar cheese sauce. The recipe below provides a similarly rich color that comes from the nutritional yeast and combination of spices such including paprika, turmeric, and mustard. The following recipe serves about 10 as a main course. Prepare pasta as directed on the package. Drain and reserve. Preheat the oven to 400 degrees Fahrenheit. Toast the bread slices, and place them in the bowl of a food processor. Process until you have even crumbs. Heat the rice milk or non-dairy milk in a small saucepan or the microwave. Do not boil. In another saucepan, melt the margarine or "butter" over medium heat. Whisk in the flour and continue to stir until smooth and thick. While stirring, slowly pour in the warmed rice milk. Add the soy sauce, garlic powder, mustard, salt, paprika, turmeric, onion powder, and cayenne pepper. Increase the temperature to medium high. Stirring constantly, continue to cook until the sauce is bubbling and thickened. Stir in the nutritional yeast, whisking until the mixture is smooth. Taste, and add salt and pepper if needed. Place the cooked pasta in a large mixing bowl. Pour the cooked sauce over the pasta, and mix until combined. Transfer the pasta and sauce into a large, oven-safe casserole dish. Sprinkle the fresh bread crumbs evenly over the top. Bake uncovered until the bread crumbs are lightly browned and the casserole is bubbling, about 20 to 25 minutes. For a herby mac and cheese, try stirring in chopped fresh herbs, such as parsley or basil, just before baking. Or try using a vegan dried bread crumb mixture with herbs. Sprinkle grated vegan "cheese" over the top of the pasta dish during the last 10 minutes of baking for a cheese-like crust. Incorporate cooked vegetables, like steamed broccoli, grilled red bell peppers, or sauteed zucchini, for color, texture, and better nutrition. Stir in chopped, sauteed jalapeno peppers for a spicy vegan mac and cheese.